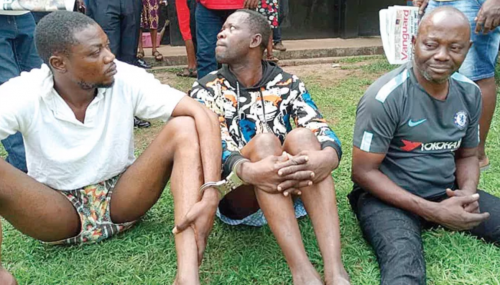 The Osun State police command said it has arrested an officer of the Special Anti-Robbery Squad (SARS) who allegedly shot dead Tunde Nafiu, a 30 year old resident of Iwo in the state on Thursday. The police also said 31 of the protesters have been arrested. This was contained in a release signed by the state’s spokesperson, Folasade Odoro, on Saturday. A police officer attached to the SARS shot Mr Nafiu, which led a violent protest. The protest resulted in the burning of a police station as well as the vehicles parked inside it. “Information was received that an operative of the Special Anti Robbery Squad attached to the Area Command Headquarters, Iwo allegedly shot and fatally wounded one Tunde Nafiu ‘m’, aged 30 years at Agboigboro in Iwo. “The Area Commander immediately moved out, doused the tension and assured the gathered youths that justice will be done. The officer that allegedly fired the shot that killed the deceased was promptly arrested and transferred to the SCIID, Osogbo for interrogation,” it said. The statement highlighted that in the early hours of 24/8/2018, a very large crowd of youth thronged the Area Command Headquarters to protest the killing. “The protest was however hijacked by some hoodlums who took the law into their hands. In the process, they torched the buildings housing the offices and residence of the Area Commander as well as three patrol vans and two other vehicles belonging to the officers of the Area Command. “The Police exercised serious restraint in order to prevent further loss of lives. However, the hoodlums were eventually dispersed while 31 of them were arrested and undergoing interrogation. The situation has been brought under control while people are going about their lawful businesses,” the statement read. Mrs Odoro also said the state’s commissioner of police has visited the deceased family at Ileogbo to commiserate with them on behalf of the police force.